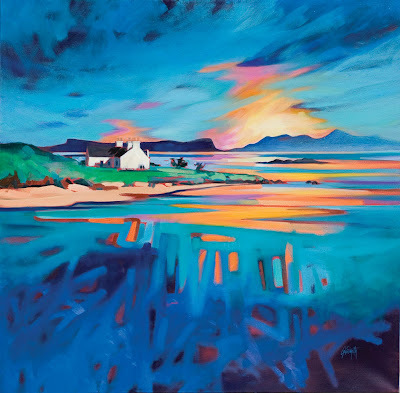 In Scott Naismith’s “A View to Eigg and Rhum”, the sunset glances off the flat sea, while a gently swell undulates towards us. The cottage is small, special, and isolate. Like a full stop, it allows us to pause and gasp at the moment. 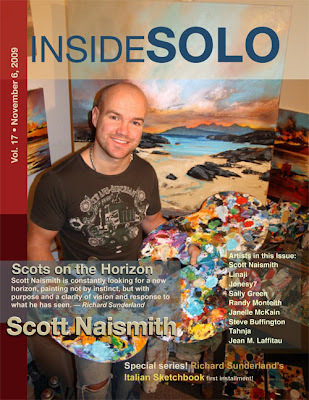 This painting is a striking example of Scott Naismith’s work. He is a master at manipulating our perception of colour. Every aspect of the canvas, every tonal shape that makes the composition is broken down. We see orange and blue, red and green, and black and white; except there is not a constant saturation of colour. Every shape of colour oscillates through a change; their luminosity is phenomenal. Each colour and shape has a purpose and a contrasting partner. Naismith cleverly changes the planar direction and creates a wall of water, showing the light filtering down to the darker depth. This under-current pushes and compresses the pictorial elements of the distant Eigg and Rhum and the white-wall cottage on the spur of land. This whole middle area is trapped between the vastness of the sky and the depths of the ocean. The sea is calm; but the wind is blowing the high clouds quickly across the scene. Hans Hoffmann would see it has having “push and pull”. The planar recession is dramatic. You are taken right to the source of light by the sea’s zig-zag. But this device works both ways: the foreground reaches up out of the depth, catching the last strands of light. And, in a fusion of brush strokes, pulls the light back toward us. So we can stand with Scott and enjoy the vista. The west coast of Scotland can vary from being almost Mediterranean to strong, North Atlantic, and wild. This contrast of mood and atmosphere comes out in Scott’s work; sometimes frantic and spontaneous; at other times, calm and sedate. Like all landscape painters who have a passion to be outdoors in their environment, recording is done at a pace, so as not to miss the moment. His constant traveling has developed a keen eye for the landscape and subtle changes he encounters— time of day, weather, a crofters cottage, a whiskey making company, or wild flowers against a vast sky. He is more Fauve than Matisse. Bold analogues, colours accented against their complimentary partners, burst with vibrant effects; sometimes in lush, bulging paint strokes. The impasto has to be taken into account— it changes the tonality of the colour, it accents and creates form. This isn’t instinct; it is purpose and clarity of vision, and response to what he has seen, contriving to create awesome plays of light. Each hue is carefully matched to maximize its expressive form and function within the painting.